Knitting, spinning, & dyeing, plus peeks behind-the-scenes and the occasional adorable cat photo. Posts and images by Cate Carter-Evans, Proprietress of Infinite Twist. Sign up for the Infinite Twist newsletter! It’s actually the most wonderful time of the year: gearing up for Lunar New Year! When it’s 2 a.m. and you pull your intarsia project out of the bag and get this. I would truly rather be sleeping. Verdict: Still wet, but they fit like a dream before blocking. I'm trying to figure out if I should release this pattern now, or wait for Fall. What do you think? I've started a new Infinite Twist group on Ravelry to help answer these sorts of questions. There will be treats and special deals and stuff too. I'd love to see you there! Have you finished any objects this week? finished object friday: Robin and knitting bags! I've got three FOs to share with you this week! Up first, Robin by Leethal in Infinite Twist Qinghai Handspun DK. The kits are coming out next week - email me if you want to pre-order! I'm really happy with how this turned out. 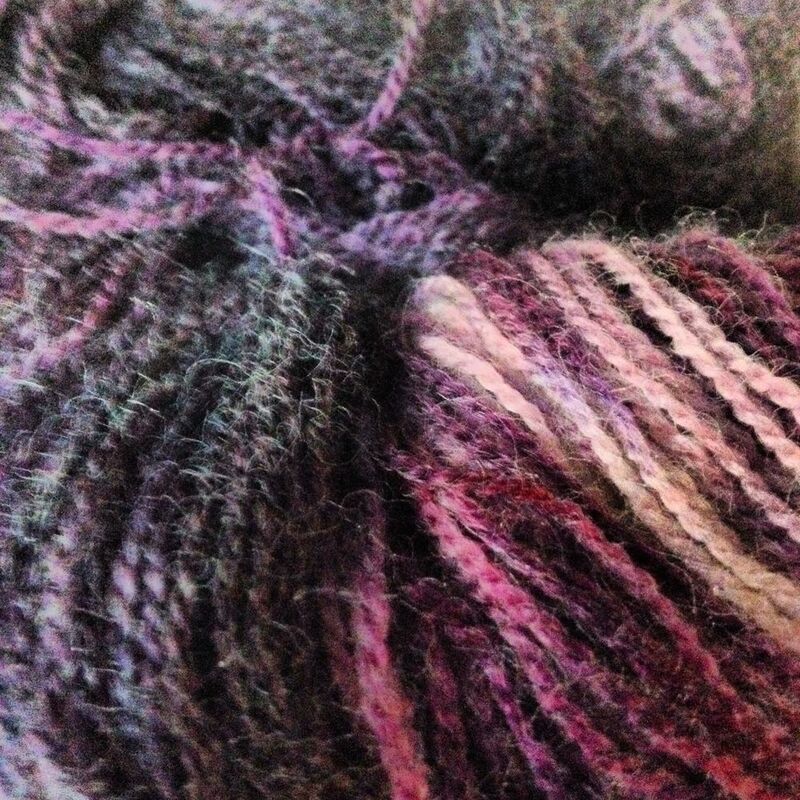 Springy and soft, with all the fun texture of hand-spun. Secondly, I upgraded my knitting luggage. There is more knitting to be done than I comfortably have time for at home, so the knitting will now be coming with me on errands and such. I made a large-ish bag using a quilt square that didn't play well with others. It's big enough to hold all three of my current WIPs, and looks nice hanging on a doorknob. I also decided I needed a small-ish bag to hold my notions - knitting gauge, stitch markers, measuring tape, little scissors, pencil, eraser, etc. I used some fun Chinese cotton my friend Bec gave me to line a patchwork bag from Thailand. 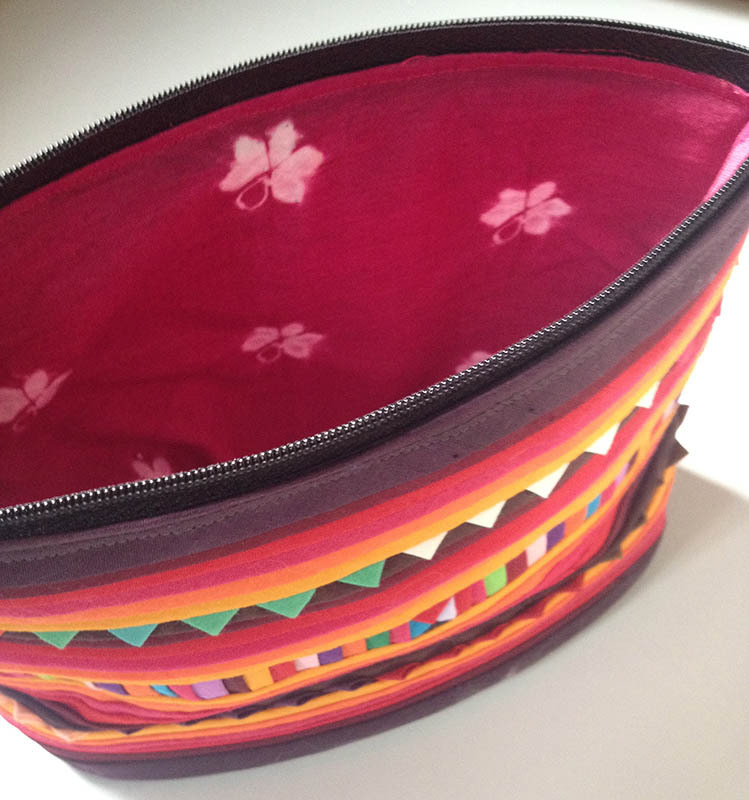 It's got a zippered top to keep everything secure. Did you finish any projects this week? If so, please feel free to share a link in the comments, or use the hashtag #fofriday on Instagram! 1. CustomFit Sweater vest from makewearlove in Infinite Twist Helix: I accepted I lost my pattern, printed a new one, and did about five rounds. 2. Randle Socks with Fish Lips Kiss Heel: the heel is turned, and looking good! The pattern is clear and well-written, and only a dollar. It's possible I will never stray from this heel. 3. Prairie Ridge Shawl: Underway! So happy to have this beauty started. Loving the pattern oh-so-much. 4. Robin (kit sample) by Leethal in Infinite Twist Qinghai Handspun DK (kits coming soon)- About halfway done. This is my fourth Robin, and I think I've almost got the pattern memorized. What's on your needles this week? 1. Robin by Lee Meredith in Infinite Twist Qinghai Handspun in Oceana and Larkspur. Done, just need to weave in ends and block. 2. Randle socks (with heavy modifications) in Blissful Knits Inspire in Full Bloom. I ran into ugly trouble of the mathy kind trying to figure out the heel with all the changes I've made. I got frustrated, and decided to try something new - the Fish Lips Kiss heel by The Sox Therapist. As it says on the pattern, "All patterns $1 each, so you can do the right thing!" I am hopeful this method will be the solution to all my heel problems. 3. Custom Fit Sweater Vest in Infinite Twist Helix in Wine Bar. I am so excited to wear this! It fits like a math major worked out compound rates of shaping on my behalf. 4. Prairie Ridge Shawl in Halo Heather in Box of Chocolates. This is my heartbreak project. Why are there not more hours in the day? Gah! I have been wanting to knit this for weeks (scratch that, months) and have been hoarding every little scrappy end bit from various kits and dye lots. What are you working on this week? This week has been delightfully full of dye! I'm working on sweater-sized kits in Helix, my new sweater yarn. I've been working up some really fun colors (if I do say so myself) - Lichen and Orchid are shown above. It's going out to product testers this week, and will be available in my shop in a week or two. If you were going to knit a sweater, what color would you want to knit with? I'd love to hear what colors you're loving in the comments! Tomorrow marks the start of the biggest of Shanghai's Holiday Craft Fairs: the Kristkindlmarkt at Paulaner, a three-day outdoor affair complete with gluhwein and sausages. In preparation, I've been busy with a tree farm of my own - tiny knitted trees with button and sequin decorations. I love making these little guys, and they're a great way to use up stash yarn. It's been a wonderful and busy week. Susan B. Anderson's Prairie Ridge Shawl Kit has been really popular, and much of my week was spent in a steamy kitchen with pounds and pounds of wool in various stages of pre-soaking, dyeing, cooling, rinsing, and drying. In between batches of dye, I worked on samples. This is a sneak peek of November's free knitting pattern for a pair of wonderfully warm stranded socks. 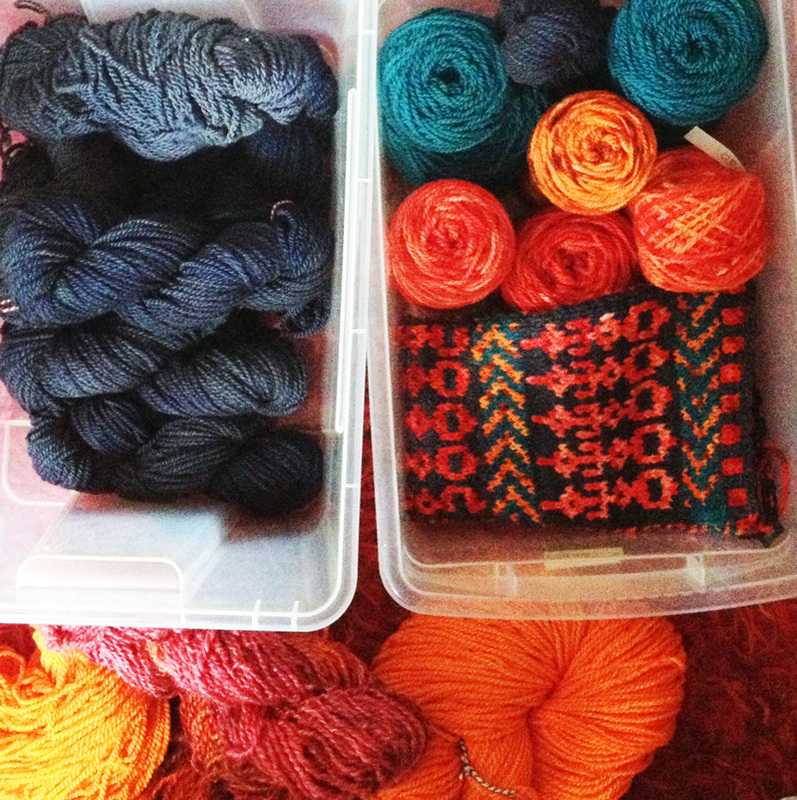 These saturated colors have been keeping me energized and excited to knit. Speaking of color, I wanted to share this photo. Last Friday, Mark and I joined a friend's wedding cruise on the Huangpu river that divides Shanghai. "Puxi" (the older, downtown part of Shanghai) literally means "river west," and "Pudong" (the sprawling new area on the other side) is "river east". These monikers occasionally morph into "Pu York" and "Pu Jersey." I never get tired of the crazy lights and over-the-top architecture of the Pearl Tower and its surrounding buildings - it's a constant reminder of the slightly surreal wackiness that I love about this city. What were you working on this week? As a weekly routine to promote creativity and happiness, I pick three projects to work on and then share the results. Feel free to post your 3 things in the comments! Thing 1: 75% of quilt top done (carry-over from last week). Thing 2: Order mums and raspberries for fall planting Thing 3: Make corduroy pants. Thing 1: Finish 75% of squares for quilt top, and create initial layout for quilt top. Result: Fail! I only made enough squares for three blocks, and made zero progress on the layout. In happier tidings, I made myself a new messenger bag out of my stash of leather scraps. I'm working to de-stash my leather by making wallets decorated with dots that I'm then selling at Jiashan Market. Some may soon make their way to Etsy. Each dot is punched out with a hammer and die, and it's really satisfying work. Thing 2: Create family budget plan for next six months. Thing 3: Plan for next year’s garden, and create proposal for increased composting at the community rooftop garden. I'm all set to place my seed order for next year, and I'm meeting today with the garden manager to discuss whether or not the garden can have chickens. What's on your list this week? Thing 1: Finish 75% of squares for quilt top, and create initial layout for quilt top. Thing 2: Create family budget plan for next six months. Thing 3: Plan for next year's garden, and create proposal for increased composting at the community rooftop garden. Thing 1: Fig & Chiptole Jam, recipe found via Punk Domestics. The jam is made, and we'll see how it tastes in a couple of weeks. Thing 2: Finished blocks for half of the quilt top. Result: Win! I picked up a couple of new fabrics this weekend to finish out the quilt top. Funny how a de-stash quilt project results in the buying of more fabric. I'll be revisiting this project this week, so expect a photo next Monday. Thing 3: Spin three skeins of gray wool for blanket project. Result: Win! I ended up with four whole skeins, and one partial. What are your three things this week? Thing 1: Make fig & chiptole jam. Recipe found via Punk Domestics. Thing 2: Finish blocks for half of the quilt top. My Dad has signed up for a version of this quilt with grey in place of the red, so you'll be seeing lots more indigo over the next few months. Thing 1: Make bread and butter pickles. Result: Win! Kinda! Made six jars. Tried a new recipe, and right now they're WAY too sweet. Hoping it'll mellow over the next couple of weeks. Things 2: Make 12 blocks for indigo quilt. Result: Win! As of this moment, 19 blocks with four squares each are done. Thing 3: Remaining 12 projects to Ravelry. Result: Win! Kinda! I realized I actually didn't have 12 projects to put up... More like 8. As it turns out, I'm actually behind on releasing patterns. The good news is I have six patterns I can release in the near future. The bad news is I have six patterns that need tech editing, new samples, or both. At least I know they're there. It even has its own smell - William Gibson described it "a faint jungle pong." It's an herbal smell, unique and almost wooly. I live in the right place to indulge in a love affair with indigo. I've collected a little bit here and there on travels, and ended up with a fair bit. High time to put the stash to good use. The fabrics are a smogasbord of textile techniques, including cool examples of block printing, stencil printing, batik, and a use of hand-stitching to create areas of resist (kind of like shibori perhaps?). I'm combining them with a really bright Chinese red cotton I picked up on a recent trip to Portland. My plan is to piece a big double happiness for the quilt back, something like this block. I'm looking forward to snuggling up with this beauty as the weather cools off. Vesper seems to like the new quilt already. The alternate explanation is that she's telling me I'm doing it wrong. Lucky (least social of cats) has established a new territory in my office, and he's been keeping me company at the computer. He's camera-shy, so it was fun to get a close-up of his face. What have you been working on this week? I'm back! I had a lovely week-long vacations from screens of any kind via a rafting trip on the Lower Salmon River on Idaho's border. While I was away, I finished up the first prototype for a new house sock design which will be released in November. I can't wait to share them with you! Thing 1: Schedule friend meet-ups for vacation week. Thing 2: Upload 3 finished objects to Ravelry. Thing 3: Finalize river trip logistics (Check and mend dry bags, buy new sunscreen, find sleeping bag, buy beer). Thing 1: Woot! I did organize and pack my vacation knitting. Thing 2: Woot! All the what-not under the bed was sorted, folded, organized, and moth-proofed. Thing 3: Fail! I did no sewing at all on the vintage textile quilt. Instead of the sewing, I organized all things crafty into one shelf, made blueberry jam with wonderful friend Bec, and spent some lazy time with my man and the cats. It felt just right. In the midst of de-stemming the blueberries, Bec and I got to talking about how we use our weekly three things, and I thought I'd share with you. But first, a wee bit of background. I'm a dyed-in-the-wool list person. I love crossing to-dos off my list (preferably in red Sharpie). I crave the state of laser-targeted single-minded focus where Things Are Getting Done, and to-do items quiver in fear of my ruthless efficiency and strategic planning. I prioritize tasks, and take on the urgent and important ones first. Then I make dinner, do dishes, and go to bed. Lather, rinse, repeat. Important stuff like "Spend 30 minutes playing fetch with Vesper," "take a break," or "do something nice for yourself" doesn't often make it onto the to-do list. There's simply too much going on... or at least that's the usual excuse. It's a brilliant recipe for creative burn-out. For me, We Three Things is the space where I take a minute to find three things each week that will inspire me, help me get past a creative block, or simply keep the chaos down to a dull roar. Sometimes I pick a challenge, sometimes a comfort, and I know there will be weeks where it's all Fail and no Woot. If you'll pardon a gardening metaphor, it's the equivalent of taking the time to turn a compost pile. If you just pile up organic material willy-nilly in a compost bin, you generally get a gooey, smelly, anaerobic mess. It takes different types of organic matter (dry, wet, green, brown), seen and unseen helpers (microbes, bugs, and more) and the sweaty, dirty work of digging and mixing and turning to make the magic happen. I'd much rather have rich, fertile, nourishing existence than a smelly mess. Thanks for being one of the helpers (seen or unseen) who makes it happen by visiting this space! There's this funny thing that happens to many, many newbie knitters. As soon as their first project is finished (usually a garter stitch scarf), they want a new technique. Garter stitch is suddenly old news. Too basic. Definitely uncool. It's for, you know, babies. While diving into new techniques is exhilarating, there's a sweet simplicity to garter stitch that's too often overlooked. Garter stitch is a simple pleasure. It's a great way to play with stripes or variegated yarn. It's also a balanced knit structure - no ends or edges rolling up, ever. It's stretchy and delightfully dense. The September samples I'm knitting this week all just happen to be in garter stitch (how'd that happen? ), plus I found an old favorite garter scarf in the archives while uploading completed projects of yesteryear to Ravelry (You can find me there with RavID infinitetwist). As soon as the samples are done, I'll be releasing the kits - one is a Beginner's Kit for a simple scarf in variegated hand-spun yarn, and a sweet little triangular scarf (no name yet) design in a mill-spun yarn. I hope you like them! Last week was a 2.5 out of 3 week. 1/3: The mango chutney making finally happened, and the results are really yummy. I've got four half-pints, which should get me through the rest of the year. 2/3: I also hung my Mom's yellow quilt in the sewing area. It's made with a bunch of textured fabrics, seersucker, and textured madras. I love that you can identify what some of the flowers are (iris, tulips, lilies), and some are delightfully abstract. 2.5/3: The polka dot fabric. Rather than making the skirt myself, I dropped it off at the fabric market to be sewn. 1. Make knitting plan and pack projects for vacation. 2. Sort, organize, and moth-proof Fall/Winter clothing. 3. Make three squares for vintage textile quilt. I'll share photos next Monday. I love my garden. I could give you a whole slew of reasons why it's not bigger, better, further along - we moved, late start, rainy spring, blah, blah, blah - but I love my garden, right where it is right now, bugs and all. Things that died: 1. bachelor's buttons. 2. sweet peas. 3. most of the squashes (due to some weird disease). I'm loving the Roma tomato plants, and kinda underwhelmed by the rainbow chard. I have a bazillion basil seedlings, and no idea where to put them. Too much basil is a problem I'm happy to have. The kale seedlings are hanging in there, despite constant threat of destruction by caterpillars. Sweet Neighbor's birds have been helpfully dispatching the little green monsters right and left. Today's dirty job was turning the compost pile at the Skyfarm. It's used by everybody at the garden, but it doesn't get much love. It was a gooey anaerobic mess back in May, but has responded really well to being re-layered. Speaking of gooey anaerobic messes, my home compost is... well.. a work in progress. I'm hoping to convert it into a worm bin in the next few weeks. Does anybody out there have experience composting with worms? My score for last week's W3T is 2/3. I did make fruitcake and arrange my vacation, but mango chutney did not happen. Instead, due to various scheduling nonsense, I did a photo shoot on Sunday for my fall line, which I'm calling a win. It as well above 100 degrees, so we scrubbed the plan for a lovely atmospheric outdoor shoot and shot everything inside. Models passing out from heatstroke is not anybody's idea of a fun time. Vesper was very helpful with the photo shoot. Even with so many people to manage, and so many hand-knits to sit on, she managed to keep it together. But on to the really important stuff - the fruitcake! I'm shamelessly proud of my fruitcake. The secret is soaking the dried fruit in bourbon for 48 hours before baking, and using lots of candied citrus. I like to use dried figs, cherries, apricots, and prunes - so it's like healthy and stuff. Ahem. This time, I used sliced almonds instead of whole ones, and the result was really nice - more of a marzipan cake texture, and better crumb structure. In case you're looking to put on five pounds, I'm happy to recommend slathering cream cheese on a slice of warm fruitcake for breakfast. Oh yeah. This week's list includes: 1. Get that pesky chutney made! 2. Make a skirt or dress or something from Indian polka dot cotton (souvenir from Delhi trip). 3. Hang yellow quilt in my sewing space. Happy Monday! As a way to jump-start the week, I'm going to be posting three things I'd like to complete this week as part of the We Three Things project. You can read my friend Bec's post about We Three Things on her blog, Shanghai Experiment. I'll also be posting pictures of projects from the week before. Last week's list included: 1. Refurbish suncatcher and make doorbell (bonus points). 2. Assemble dressers and install closet bar 3. Take a break and watch The Colony. All three things got done! The most photogenic project was working on the suncatcher. This little beauty was a birthday present seven years ago, made by the very talented Nancy Davis. It had gotten a little bit beat up and tarnished over time, so I soaked it in vinegar to brighten up the copper, and added some new strings of beads, keys, and bells. I also did a quick macrame project with a bunch of brass bells I found in Yunnan province, plus some other random bells from my stash. The front of the house is looking more fun, and I love having the sound of bells alert me to the presence of visitors. Feel free to join We Three Things - post your things below, or post a link to your blog! It's been a fun and busy week. I spent lots of time at the loom this week, working on the Spectrum rug. I'm moving through a color sequence from maroon to purple to pink to red to spice to orange, and next, onto yellow. ...and I'm working on a new sock design to which Rufus has taken a shine. I can't wait to wear these! I'm working on a project that's been a couple of years in the planning. It's a simple woven rug with a color progression from gold to orange to russet to red to fuchsia and purple. I'm using a ton of stash yarn in this project, including some of the very first yarn I spun. I'm also getting to use up some very special bulky yarn made from the recycled thrums of other weaving projects. This project is going along really quick, and I can't wait to see what it looks like on the floor.